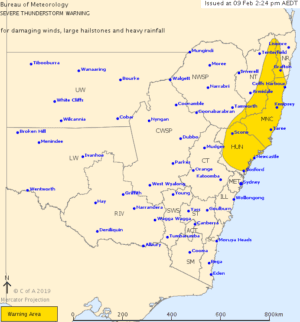 A severe weather warning is in place for residents in the Mid North Coast, Hunter and parts of Northern Rivers and Northern Tablelands areas. These severe thunderstorms are likely to produce damaging winds, large hailstones and heavy rainfall that may cause flash flooding over the next several hours. Locations which may be affected include Gosford, Newcastle, Taree, Grafton, Port Macquarie and Coffs Harbour. It is advised that people, move their cars away from trees, keep clear of creeks and storm drains and secure loose items around their house. For more information visit the Bureau of Meteorology.